The drive to win is especially strong in gamers. If you want to be the greatest you’ll need excellent skills and the right gear to rely on. When gaming gets epic, MSI Vigor series keyboards provide the solid base you need for victory. Using Cherry MX Silver mechanical switches, the most popular switch in the world, provide excellent feedback and over 50 million life cycles. Especially perfectly suited for gamers with a low actuation. This enables more rapid actuation during a gaming session. Indicated on the keyboard are hotkeys that provide direct control for MSI GAMING motherboards and graphics cards. This allows you to apply any of the three performance modes without having to switch out of the game. Set up your keyboard in your own style. Vigor GK80 offer 2 different versions of keycaps, one set with luxury metal cover(4 keys), the other set is textured using double injection of rubber surface(12keys). A sturdy palm rest is also included for extra comfort during longer gaming sessions. 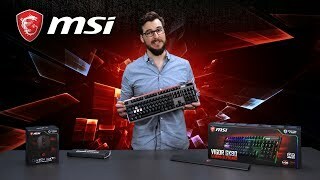 More links for "Vigor GK80 USB RGB Mechanical Gaming Keyboard Cherry MX Silver Speed Switches UK Layout"